The term Nessmuk trio refers to a double-bit hatchet, a fixed-blade knife, and a folding knife carried on the bushcrafting expeditions of George Washington Sears, who published stories of his adventures under the pen name “Nessmuk.” Many outdoorsmen, especially those who take an interest in the history of bushcrafting, have heard of the Nessmuk trio. Many modern bushcrafters carry their own version of the Nessmuk trio into the bush with them. Here’s an in-depth explanation of the classic Nessmuk trio and how modern outdoors culture and technology has adapted it. Nowadays such axes are made in America by Council Tool, for example, with its great Velvicut Saddle Axe. You can also get a double bit hatchet from Marbles and other manufacturers. The fixed-blade Nessmuk knife had a hunting or skinning shape, “thin in the blade” according to Sears, and was “handy for skinning, cutting meat, or eating with.” Sounds simple enough, and it is. Sears didn’t like big Bowie-style knives, but the main thing was to have a solid fixed-blade knife that would serve you well when processing meat or eating. Sears didn’t use his fixed-blade knife to carve or process wood. For that, he had his other knife – the folding knife. The folding knife used by Nessmuk was meant for one thing – carving and processing wood. This is confirmed by other sources from the time – folding knives (with either one blade or two at opposite ends of the handle) were used for woodworking. Nowadays, the Nessmuk trio is usually modernized. People who carry a “classic” or traditional Nessmuk trio into the bush are probably doing it more for fun than for their real bushcraft needs. It’s a fact, for example, the most carving and wood processing is done with a fixed-blade knife instead of a folding one. And fixed-blade knives aren’t so common anymore – why would they be, when you can have a SAK (Swiss Army Knife) or multitool with you? The double-bit hatchet is usually more than most people need. While the two edges are handy for allowing you to use each one for different tasks and purposes, most people will only need a regular, single-bit hatchet or axe when they’re hiking or camping. 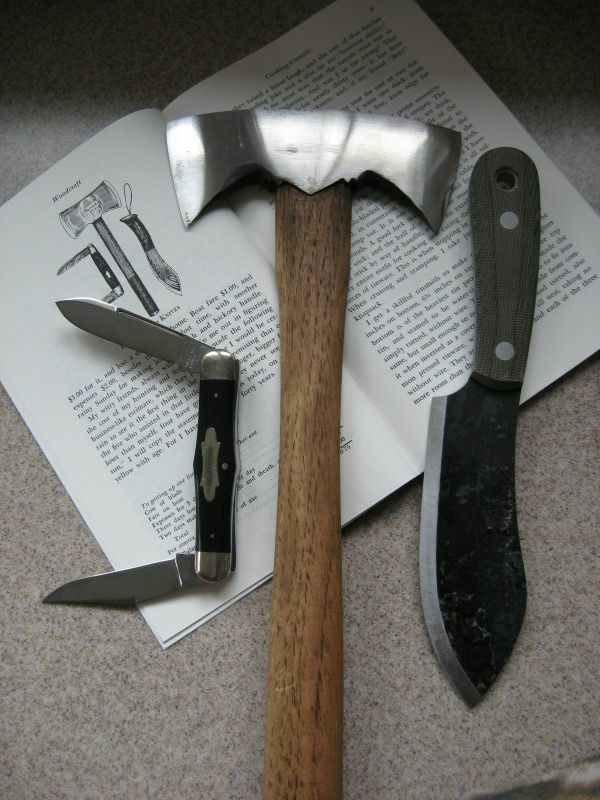 You might even replace the hatchet or axe altogether with a folding saw, since that can do most of the tasks of the axe (cutting firewood or saplings to create shelter) at a lighter weight. A fixed-blade knife for carving and processing wood and cutting meat and other food. Ultimately, it’s up to you to decide what loadout will suit you best where you’re going. George Washington Sears AKA Nessmuk found that his Nessmuk trio suited him best for the types of expeditions he went on in the time that he lived, with the technology available to him. You don’t have to rigidly follow his setup just because it comes from a famous historical outdoorsman. As always, it’s about adapting to your situation and your needs that is the essence of bushcraft. I think Nessmuk himself would agree with that. Thanks for reading! Hi, my name is Michael Culligan and I’m the founder and operator of Awesome Axes. I’ve enjoyed using axes since I first split logs for firewood at my grandparent’s country home. I set this website up to share my enthusiasm about all things axe (and outdoors) with you – thanks for reading!